A few days after Thanksgiving, we had some people over for dinner. We had a still untouched pumpkin pie, so we served it for dessert. They commented they had never eaten homemade pumpkin pie before. I was astonished! Imagine my surprise when I told this story to someone else who admitted the same thing. It reminded me of a time in college when one of my roommates was making lasagna for dinner. Another roommate walked in and said, “You can make lasagna? I didn’t know that. I thought you only bought it frozen.” Upon questioning her, her mom had never made lasagna which she attributed to picky eaters. 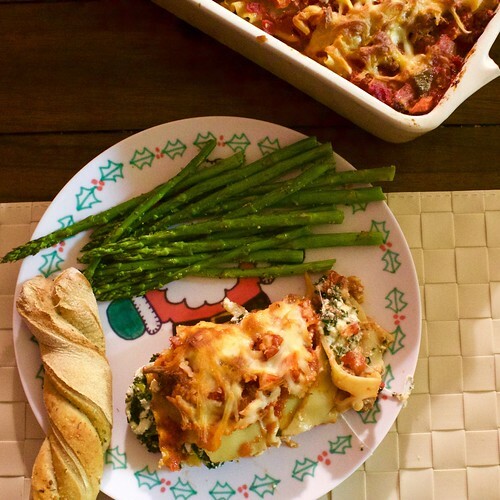 All of these experiences plus the holidays (when I know many people seem to eat lasagna) inspired me to make my lasagna recipe and share it with you. Everyone (including myself) thinks lasagna is hard. It’s really quite easy. It is a “little” time consuming. Only in that you need to plan ahead. But it is pretty hands off for most of that time. And it can easily be made ahead of time. Enjoy! 1. Brown sausage. Add onion and carrots. Sauté until onion is tender, about 5 minutes. Add garlic; cook for 1 minute. 2. Add tomatoes through black pepper. Stir to distribute seasonings. Bring to a boil. Reduce to a simmer; cook for 20-30 minutes, until thickened to desired consistency. Taste and adjust seasonings as necessary. Remove bay leaves before serving or blending. 3. While sauce cooks, cook lasagna noodles according to package directions. Before cooking, see how many noodles fit in your 9×13 pan (or lasagna pan). You will have 3 layers, so cook that many noodles. 4. Thaw spinach and squeeze out water. Mix spinach, ricotta/cottage cheese, egg, ⅓ cup Parmesan, and ¼ cup mozzarella. Set aside. 6. Spread a very thin layer of red sauce in the bottom of your pan (9×13 or lasagna). Top with a layer of noodles. Top with a layer of red sauce. Another layer of noodles. Now a layer of the ricotta/cottage cheese mixture. Another layer of noodles. Top with a layer of red sauce. Sprinkle remaining Parmesan and mozzarella cheese evenly over the top. 7. Bake at 350 for 30-45 minutes, until heated through and beginning to brown slightly. Recipe notes: You could use lean ground beef or turkey instead of sausage. I prefer the flavor of sausage. You could easily leave out the meat too for a vegetarian lasagna. You could also throw in a bell pepper to the sauce. This sauce is my basic marinara sauce recipe halved. I usually make the full recipe and just have leftover marinara to freeze. I think I slightly prefer cottage cheese, but that is because that is what I was raised on. Ricotta is yummy too. If you want to make this ahead, assemble the lasagna. It can be covered and refrigerated for 1 day before baking. I’d increase the baking time to 45 minutes-1 hour then. Or, you could assemble it and freeze it. Then you’d bake it covered for about 1 hour, then uncovered for 30 minutes-1 hour, or until it is cooked through. This might be a bit full for a standard 9×13 pan. Just keep your layers thin. I have a lasagna pan, which is a bit bigger. I love it. If you have a bigger casserole dish than a 9×13, use it.